BIRMINGHAM, Ala. – Floodwaters from Tropical Storm Cindy covered timberland and fields across the rural Deep South on Saturday, but the sun peeked out enough to offer hope that the worst was over. 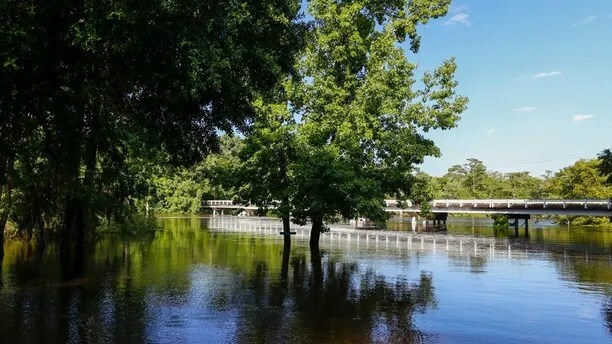 Swollen by heavy rains and flowing quickly, the Chickasawhay River was out of its banks near the southeastern Mississippi town of Leakesville and nearly 9 feet (3 meters) above flood level with the water still rising. An abandoned bridge spanning the river collapsed earlier in the week. The National Weather Service said the Mississippi coast received nearly a foot of rain over the four-day period ending Saturday, the most in the region. As much as another 3 inches (8 centimeters) of rain was forecast around Leakesville, a town of 900 people by Sunday, possibly making flooding conditions worse, said Trent Richardson, emergency management director for Greene County. Storms extended from southern Louisiana to northeastern Georgia, but Richardson said he was encouraged by occasional sunshine and revised projections that showed the Chickasawhay cresting lower than expected by mid-week. Rainfall totals of 6 inches (15 centimeters) and more were common in southeastern Mississippi and southwestern Alabama, the weather service said. The agency reported minor flooding at more than 30 locations in Louisiana, Mississippi, Alabama and the Florida Panhandle. Water covered a street in Merrill, Mississippi, about 25 miles (40 km) from Leakesville. With remnants of the storm pushing through the Northeast, additional minor flooding was reported along the storm’s track in Indiana, Kentucky, Ohio and Pennsylvania. Forecasters said rough surf and rip currents were still a risk along the Gulf Coast, but skies were mostly clear and many beaches were full of weekend visitors. A 10-year-old Missouri boy was struck and killed by a log thrown on to an Alabama beach by a big wave as Cindy moved through the Gulf, and authorities said a man drowned Friday while trying to help children in rough surf in the same area.